July finally saw our lon g-awaited Summer arrive as temperatures soared into the 90’s at one stage and suddenly we were running around in the Office swapping the heaters over for fans! On the 6th July, Strutt and Parker hosted their first Antiques Road Show event in the Tithe Barn. The sun shone throughout the day and the set up in the Barn worked brilliantly as visitors were able to bring along their pieces of jewellery and other items to be valued. One item in particular was an eye-watering amount! The Event was very successful judging from the very positive feedback received from Strutt and Parker and we hope they will return another year. 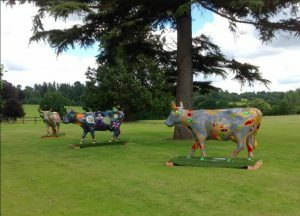 The Cows moooooved into Loseley straight from the Downs Solicitors Surrey Hills Cows Parade as a centre piece for a Client drinks reception. They were much admired! 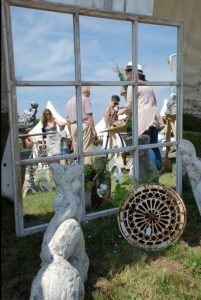 The Decorative Home and Salvage show returned to Loseley on the 15th to 17th July bringing even more stalls than previous years with an eclectic collection of garden furniture and statuary, restored and up-cycled furniture and period home fixtures & fittings. The very popular annual Summer Garden Show run by Jane Sterck & her team took place on the 22 – 24 July which offered specialist nurseries, garden suppliers, artists, local produce and fashion & gifts of all kinds. Thankfully the temperatures calmed down after the mini heatwave earlier in the week and and the Show was a huge success with over 7000 visitors over the 3 days. Groups have been very busy this month with over 20 societies, clubs & associations visiting us to enjoy tours of Loseley House and our beautiful Gardens. These have included a local Catenian Association who held a Mass in the Chapel, the Jane Austen Society of North America keen to see where some of the filming of both Emma (2009) and Sense & Sensibility (2008) took place, German visitors from a twinning assocation and VIP Americans. We also had a very intrepid group from London who arrived by train, bus and foot! The hollyhocks in the Herb garden are absolutely magnificent this year with some being well over 8 foot tall! In particular, Burney, our Head Gardener says the hot fiery colours of the annuals in the Flower Garden are very striking and well worth a visit. In August the White Flower Garden comes into it’s own with the magnificent display of white hydrangeas, hostas and borders of white, cream and silver plants combined with the fountain and lily pond makes for a very romantic spot for Wedding couples to enjoy their drinks reception. As ever we look forward to welcoming you to Loseley Park and a reminder that Loseley House closes to the public at the end of August however our lovely Gardens remain open until the end of September.